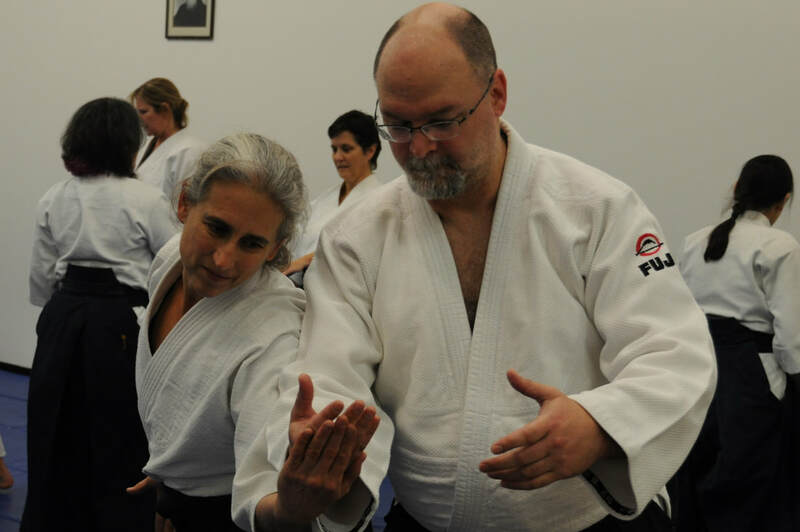 All Aikido classes are taught by Aikiki Hombu-certified instructors under the direction of Ned Danieley, 6th dan. near the intersection of Sparger and Hillsborough Roads. Visitors and new students are always welcome! Aikido (the way of spirit harmony) develops the power of the mind and body working in concert, emphasizing the use of blending and awareness rather than force and resistance. As a martial art of defense, Aikido techniques rely on a calm mind, relaxed body and accurate positioning rather than strength and size. As well as being an effective self defense, Aikido is a healthful exercise, a moving meditation, and an enjoyable work-out for students of all ages. 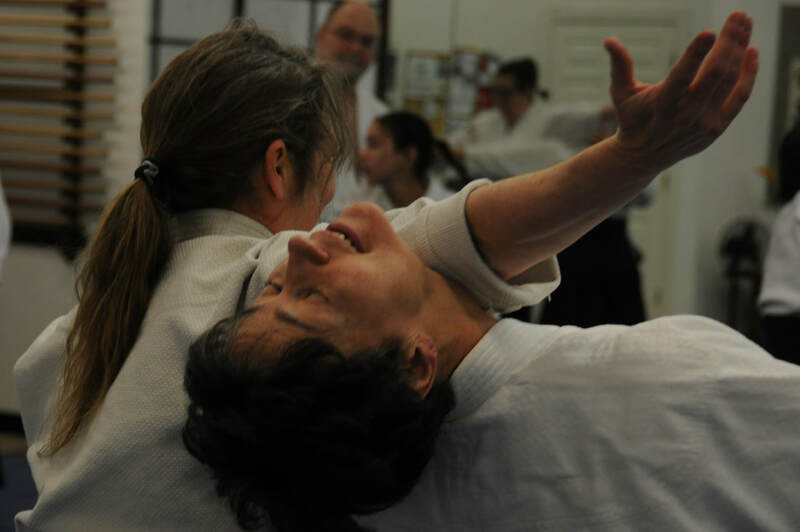 At Triangle Aikido, experienced instructors provide training in a safe and supportive atmosphere, offering a constructive way for adults and children to use their energy more peacefully and effectively. Family classes teach kids and parents to resolve conflict without violence while building body awareness and coordination, teaching respect and discipline, fostering sensitivity and self-confidence, and having fun – without punching, kicking or screaming! Please come watch a class! Visitors are always welcome in our dojo. Have questions? Send us an email at info@TriangleAikido.com. January 11-13, 2019: Fifth Annual Friendship Seminar! We had an AMAZING weekend on January 11-13, 2019 at our FIFTH annual Friendship Seminar at Triangle Aikido! EIGHT instructors joined us this year, including Cyd Curtis Bates from Aikido of Northern Virginia, Katie Haywood from Open Sky Martial Arts, Leslie Kausch from Greensboro Kodokan Aikido, Lynn Morrison from Florida Aikikai, Takiko Noehl from Seibukan Aikido, Charlene Reiss from Triangle Aikido, Yvonne Thelwell from Aikido of Arlington, and Connie Truemper from Aikido Schools of New Jersey. Many more photos to come as soon as someone sorts through all 1800 that were taken!! We are proud to have Don join the ranks of udansha following a great shodan demonstration. And thanks to all of those taking ukemi! Great work! Check out our Dojo Photos page for pics from this year's Winter Training! Our fourth Women Instructors Friendship Seminar was a fantastic success! Thanks to everyone who came out for a full schedule of training with great teachers. We had so much fun and are looking forward to next year! And congratulations to Bob on a great 4th kyu test! Great work! Congratulations to Adam and Troy! We're excited to have two more blue belts in the dojo! Congratulations to Adam and Troy on great demonstrations! Congratulations to Andrea, Daniel, and Nick! Great work by Andrea (1st kyu), Daniel (4th kyu) and Nick (4th kyu) in their recent promotion demonstrations! Proud to see the progress they have made and look forward to their continued success! Congratulations to Brianne and Nathan! Excellent 7th kyu demonstrations by Brianne and Nathan. Wonderful to see their progress! Congratulations to Dana, Ken, and Bob! Dana and Ken achieved their 1st kyu promotions with excellent demonstrations! Congratulations to Bob on covering a couple of kyu tests at one time! Congratulations to Lea, Rebecca, Tom, and Tim! Excellent demonstrations for 7th kyu by Rebecca, Lea, and Tom! And Tim did a great job on his 4th kyu test. Their good work makes us all proud! More congratulations to Dana, Don, Ken, Tim, and Will! Congratulations to a few more of our students on great demonstrations! Kudus to Don on achieving 1st kyu , Dana and Ken on 2nd kyu, Will on 6th kyu, and Tim on his long-awaited and well-deserved 5th kyu!! It's always a pleasure to see the results of the time and effort our students put in to their practice. We're proud of everyone who tested this summer and look forward to many more excellent demonstrations of their Aikido skills! Congratulations to Andy and Andrea! Congratulations to Andy on an excellent 6th kyu test and to Andrea on a great 2nd kyu test. Wonderful to see the progress they've made from the work they have put into their practice. We're looking forward to a few more tests in the coming weeks. Check out our photos page for some fun action shots of the events!